Firefox has been blocking outdated versions of Flash for quite some time now. This isn’t news; it’s click-bait. Update to the newest version of Flash, version 18.0.0.209 (as of this moment), and Firefox will remove the block automatically. A long password is, generally, more secure than a complicated one. “%n7yP!zza” can be cracked in under 2 hours. “ilikepeasandcarrots” takes around 2.53 thousand centuries. Include spaces, and it leaps to 7.66 hundred million trillion centuries. I know this is a gross oversimplification of factors that can influence a password’s guess-ability, such as entropy. 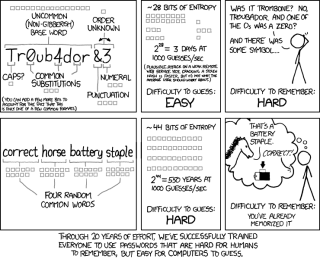 But in almost all cases, password length contributes more significantly to overall password strength than complexity (see also Password Strength at xkcd). I’ve mentioned KeePass and LastPass elsewhere, but if you’re not already using a password manager I highly suggest giving one of those two a go. If you happen to receive any letters, phone calls or emails from “Domain Registry of America” warning you that your domain name is about to expire, you may safely ignore them. The best thing to do is toss the letter, report the telemarketing call to the FCC (at https://donotcall.gov/ ) or delete the email. We see spam from that company often and the letters are particularly misleading. Unless you read it very carefully and examine the fine print, the letter makes it sound like you’ll loose your domain name if you don’t register with them. For the record, Frutke does provide domain registration and renewal services for our clients, but is in no way associated with “Domain Registry of America”. We also like pizza (also just for the record).